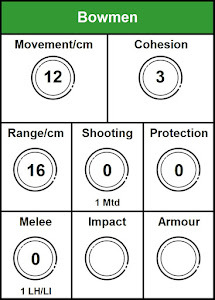 In Part 1 & Part 2 I released process specific reference sheets and army specific unit cards respectively. Since then I've played a few more games. I've found some of the sheets, and all of the units cards, very helpful. However, I've also spotted some errors; mainly with the cards. I've now had time to correct the process sheets and unit cards. I decided to edit the pdf link in Part 1 to point to this post. I removed the full page image of the unit card from Part 2 because there were two or three things that needed changing. As of Fri, 23 Mar 2018 there's a new static page where you can download the latest versions of all my ADLG resources. I've done this to simplify the process of keeping links and downloads up to date. Personally, I find the game set up sheets and the unit cards really helpful. In my last game (post to come) I found that I was not totally reliant on my opponent; so that's a step in the right direction. Of course it's not ideal when you spot errors but it's all part of learning the game and fine tuning the playing aids. I bought the book and found that the "next big thing" in ancients tabletop wargaming was in fact more poorly written and less immediately comprehensible than good ol' Barkerese DBx, so I ran out and purchased FoG II for the PC. Damn, if it isn't fun - easy to find opponents online or I can play a reasonably competent AI. And zillions of "painted and based" armies at hand. Your excellent efforts may lead me to have another look at ADLG. You've put in the intellectual effort whereas I CBF. But somehow I feel a rubicon may have been crossed. I've seen the future and it works. The game plays, and flows, reasonably well but the rules are as you say. They start off simple but get very detailed, very quickly only to be followed by special cases. Related things are often pages apart. Also I wonder if the person who did the English translation was a former DBM player as the wording is strikingly familiar. I've heard rumours that the next version will try and address these issues. Fingers crossed. Update: Minor addition to Process Sheets. Added WWg in difficult going to terrain effects on combat (Melee sheet #4). Download link above points to new document. Update: This post is now the only one with download links for the aids and cards. This will make it easier to keep the links pointing to the most current versions. All previous have been edited to point to here and all subsequent posts will be linked to this post. Update: New version of process sheets available for download. Minor clarification of Protection factors for armoured foot with small change in layout. 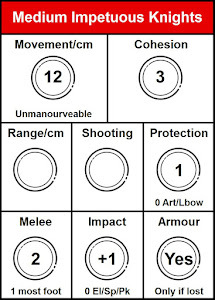 Update: Unit cards contains correction for non-impact cavalry vs. MI at impact. Update: Unit cards added for a Timurid army with a Steppe Mongol ally. Not all option covered at the moment. Update: Added pdf of all unit cards produced to date. Update: Changed download links to new static ADLG resources page.